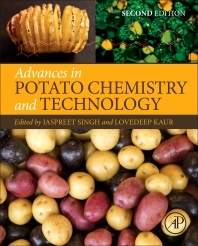 Advances in Potato Chemistry and Technology, Second Edition, presents the latest knowledge on potato chemistry, including the identification, analysis, and uses of chemical components in potatoes. Beginning with a brief description of potato components, the book then delves into their role during processing, then presenting information on strategies for quality optimization that provides students, researchers, and technologists working in the area of food science with recent information and updates on state-of-the-art technologies. The updated edition includes the latest information related to the identification, analysis, and use of chemical components of potatoes, carbohydrate and non-carbohydrate composition, cell wall chemistry, an analysis of glycoalkaloids, phenolics and anthocyanins, thermal processing, and quality optimization. In addition, new and sophisticated methods of quality determination of potatoes and their products, innovative and healthy potato-based foods, the future of genetically modified potatoes, and the non-food use of potatoes and their products is discussed. Dr. Jaspreet Singh, Senior Research Officer, Riddett Institute, Massey University, New Zealand. Dr. Singh's research focuses on characterising future carbohydrates to develop novel and healthy food products. He leads several research projects on potatoes, starch, cereals and supervises graduate and post graduate students at the Riddet Institute. He has characterised Taewa (Maori potatoes) of New Zealand to develop new and nutritionally rich food products. Collaboration is a key part of his research and he works in collaboration with food chemists, engineers, nutritionists, and the food industry. He is committed to sharing research with others and has published research papers in international journals, written book chapters and presented his work at international conferences. •In vitro digestion of different food proteins and starches. •Physico-chemical, functional and nutritional characterization of starches from different sources; potato tubers and their flours. •Physico-chemical and functional characterization of different polysaccharide gums. •Development of novel food structures and exploring ways to alter the existing meat protein structures to change their digestibility profiles. •Screening of various plant sources for their antidiabetic potential in vitro. •Effect of kiwifruit proteases on the digestion of different food proteins.